Thomas Stumpf's teaching career began somewhat inauspiciously in 1974 while he was living in London, giving piano lessons at the American School and at St. Margaret's School (in Bushey, Herts.) to bolster the relatively small salaries he was earning from a burgeoning international career as a collaborative pianist. In 1978, while still a student at the New England Conservatory, he began to teach at the NEC Preparatory Division. For ten years he taught students ranging from 7-year-old beginners to high school seniors preparing for their entrance to music colleges. In 1979 he became a member of the NEC college faculty: he was Coordinator of the Secondary Piano Program, teacher of undergraduate and graduate piano performance majors, and instructor of a graduate 2-semester course in Contemporary Piano Techniques. Many of Stumpf's students went on to considerable musical careers of their own, and his time at NEC laid the foundations for his teaching style and philosophy. In 1984, Stumpf became Assistant Professor and Keyboard Area Coordinator at the College of Music at the University of Massachusetts Lowell. He taught undergraduate and graduate piano performance majors as well as courses entitled Piano Pedagogy and Special Topics in Keyboard Literature. He was also Director of the Piano Chamber Ensemble. During the next six years he received several Professional Development Awards from both the College of Music and the Department of Performance at UMassLowell. In 1990, Stumpf left UMassLowell to become Associate Professor and Chair of the Collaborative Piano Department at Boston University. He re-designed the Master's program and created Bachelor's and Doctoral programs for the Collaborative Piano Department. He taught courses in Collaborative Piano, Piano Literature, Song Literature, and Chamber Repertoire for Pianists, and an Advanced Performance Seminar for singers and their pianists. During his time at Boston University his department increased from the 2 majors he took over upon his arrival to 20 majors, many of whom have auspicious careers in music. Some of his students, both pianists and singers, thought of him has someone who changed their lives, not only as performers but as musical thinkers, and some of his colleagues greatly admired his contributions to the School of Music. Other students and especially colleagues found him to be a controversial figure because of his pedagogical style; he ran afoul of B.U. politics and was not granted tenure. And so, in 1997, Stumpf's career as a full-time professor in academia ended - while his position as Director of Music at Follen Church in Lexington MA became increasingly central to his work. He has nevertheless continued his college teaching career: he taught an Introduction to Music course at Bentley University for five years; and he returned to UMassLowell as piano teacher and Director of the Piano Ensemble, as well as instructor of Introduction to Music and Choral Conducting Techniques courses, until 2012. In 2007, he became a piano teacher and chamber music coach at Tufts University. Of all the venerable institutions at which he has taught, Stumpf found Tufts to be the one that most suits him and in 2012 he was delighted to add Co-Director of the Opera Ensemble and Staff Pianist to his responsibilities there. Piano students of his at Tufts have won the King Award and the Tufts Concerto Competition. Stumpf has also given lectures, piano lessons, vocal coaching sessions, and has taught or co-taught masterclasses, at many colleges in the U.S., including New York University, the Longy School of Music in Cambridge MA, Southern Connecticut State University, Ohio University, the University of Indianapolis, Southern Methodist University in Dallas TX and the University of North Carolina Wilmington. He has given masterclasses for pianists, composers and singers at the Boston University Tanglewood Institute. Stumpf's distinguished teaching career extends beyond the U.S. Since 1988 he has regularly given lectures, masterclasses and recitals at the Musikschule in Mannheim. His work there has twice centered around the music of Mozart: in 1991 as part of Mannheim's celebration of the bicentennial of Mozart's death and in 2006 as part of that city's celebration of Mozart's 250th birthday. In 1990 he co-taught masterclasses with soprano Joan Heller at the Gnessin Institute in Moscow and the Rimsky-Korsakov Conservatory in St. Petersburg, Russia. 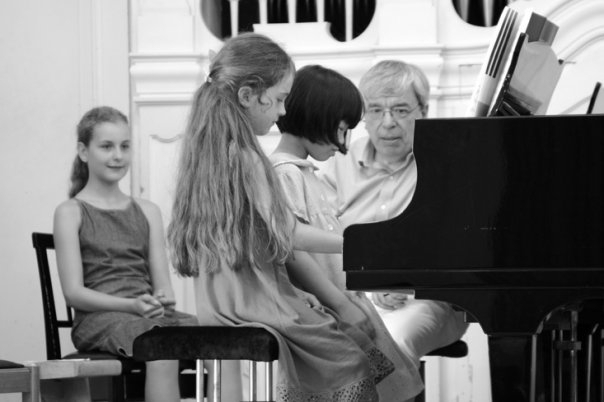 He taught piano and chamber music at the Montanea Festival in Switzerland. In 2010 he led a week-long course in vocal chamber music for singers at the Schloss Henfenfeld Opern-Akademie outside Nürnberg, Germany. - He believes that the students' technical abilities and musical desires must be used as the starting point of his teaching. - He believes that the students' active involvement in their education is of paramount importance. Therefore, he never spoon-feeds. - He believes music to be a form of expressive communication. Technique is vital, but only when it is made clear that it is never an end in itself, that it is always in service of expressive communication. - He believes that whatever information he sets out to impart has to become integrated into the students' beings. Teaching involves no sense of self-importance. - He believes that the human condition is the true subject-matter of music. Therefore he sets out to understand, and then to teach, his students as complete human beings. He loves the fact that several students have remembered the following statement of his above all others: "The most important thing is to be a good human being. By far secondary (though by no means unrelated) is to be a good musician. And a distant third is to be good at your particular instrument."